The northern Khartoum criminal court sentenced two Darfuri students, Mohamed Yagoub and Ibrahim Abdelrahim, to fines of 2,500 SDG (approximately $372) for convictions under Articles 67 (rioting) and 99 (interfering in the work of a public servant) of the 1991 Sudanese Criminal Act. The two students were arrested on 24 September. During the last hearing for Asim Omer, a student activist and a member of the Committee for Independent Students (CIS) who faces the death penalty for his alleged involvement in the killing of a police officer. Omer was arrested in May 2016 during protests by university students against the alleged selling of the university campus and since then, he has been in detention without access to a lawyer for most of this period. His trials have attracted hundreds of students and activists who believe that the case against him has been fabricated. Yagoub and Abdelrahim were sentenced to a fine of 2,500 Sudanese pounds each (approximately $372) or one month in prison in case of non-payment. 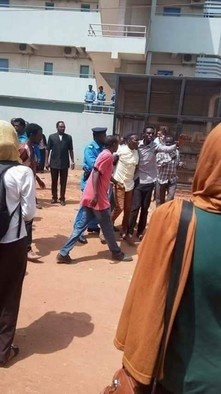 Darfuri students have been facing a crackdown and a campaign of arrests at Sudanese universities and this has led more than 1,000 students to resign from Bakt Al-Rida University in recent months.